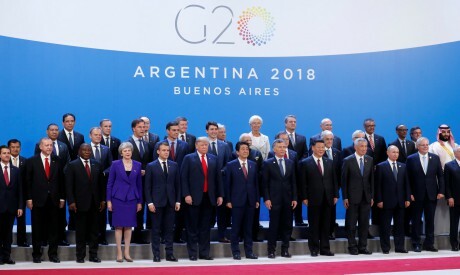 G20 powers open two days of summit talks in crisis-hit Argentina on Friday after a stormy buildup dominated by US President Donald Trump's consensus-bucking crusade to realign world trade. Following the USMCA signing, and once Argentina's President Mauricio Macri has opened the first of the summit's two days, a mass protest is planned for central Buenos Aires Friday afternoon. "There's a lot of people who don't have houses and don't have work. They are not focusing on the people who have needs," barber Ariel Villegas, 47, said at one protest Thursday outside the Argentine Congress building. The United States has cast talks Saturday with Xi as a deadline for China to cave on key trade concerns of Trump, who has slapped $250 billion in tariffs on the Asian power. The state-run China Daily said Friday that both sides could find a deal in Buenos Aires but warned the United States against pushing too hard on technology, amid US accusations of widespread theft by Beijing. "Should there be any other aspirations, such as taking advantage of the trade spat to throttle Chinese growth, then an agreement is unlikely to be reached," the newspaper said in an editorial. German Chancellor Angela Merkel is one of the leaders due to sit down with Trump on Friday. But she will miss the summit's opening after her plane was forced to make an emergency landing in Cologne due to a technical problem. Her temporary absence could complicate French President Emmanuel Macron's attempts to build a European front against Trump at a meeting of EU leaders attending the G20 on Friday morning. Late on Thursday, Macron was defiant as he rejected those who wish to confront economic challenges by being "bellicose, isolationist and closing down borders." He also warned that France would refuse to move forward on a trade accord with South America's Mercosur bloc if Brazil's incoming far-right president, Jair Bolsonaro, pulls out of the Paris climate accord. Trump has yanked the United States out of the Paris pact, and his opposition to collective action stands in defiance of scientists' increasingly urgent warnings that the planetary threat needs policy redress now. But with a major UN meeting on climate change starting next week in Poland straight after the G20, UN chief Antonio Guterres said in Buenos Aires that "this is a make-it-or-break-it moment." "Will we even have a communique? It really is an open question," said former Canadian negotiator Thomas Bernes, a senior fellow at the Ontario-based Centre for International Governance Innovation.